Jacob Davenport » What Happens Now? Andy had been drawing his Iceland cartoon for over a year when we made this. At one point, he even had a panel with two characters playing Pikemen although it is not quite clear to me how anyone could cheat at that game. 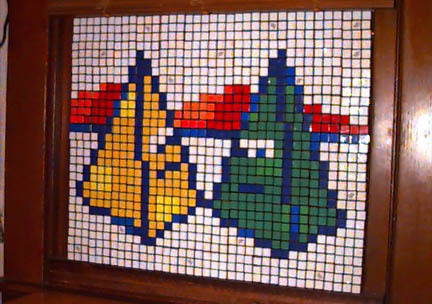 This cube sculpture was designed by Andy as an acceptance of the challenge to make cube art depicting a pyramid. Also, my pyramid was not very exciting to look at, so Andy needed us to try again.